Chicago is a tongue-in-cheek look at the manipulative power of the press, the workings of 1920s American courtrooms, and the desire to escape the mundane in order to achieve the dizzying heights of being a celebrity. The original play is based on a number of true stories, and the celebrity treatment of the accused by the press of the time. Dating back to 1975, the subsequent musical was a long-running Broadway success, and a major 2002 film—which probably explains why many people will know many of the songs and have a clear image of the vivacious young women at the centre of the piece. The musical centres on the trial of Roxie Hart (Heidi Enchelmaier), interweaving her story with that of fellow murderess Velma Kelly (Joanna Nash). Velma is already in prison—attracting widespread press attention following the murder of her cheating husband and sister. But Velma disappears from the front pages when Roxie murders Fred (her lover, who had threatened to leave her). Both women employ Billy Flynn (Joshua Moore) to defend them. Flynn is an expensive and super-confident lawyer, who has worked out the importance of having a good story for the press as a route to gain his clients’ acquittal. Presented as a ‘vaudeville show,’ the musical is introduced by a ringmaster (Tony Meggitt), with interjections from the musical director (Benjamin Tubb-Hearne) and even frequent cast requests for ‘my exit music.’ Sherryl-Lee Secomb (Director) set the scene, incorporating a smattering of circus-style silk performance even before the show began. And ensured this styling was maintained through the show, providing some fantastic opportunities for the ensemble. The show has a number of major set pieces, where all 40+ members of the cast were on stage, getting everyone’s feet tapping. The opening All that Jazz may not have been quite as upbeat as we might have hoped. But there was some excellent ensemble work in this production: the circus-styling of Razzle Dazzle, and the superb Cell Block Tango (“He had it coming”), were particular highlights. Congratulations to the choreographic team, led by Desney Toia-Sinapati (Me and My Baby being one of many memorable routines)—and of course to the whole cast, but in particular to the dancers (Amy MacGregor, Izzy Smith, Jade Wright, Kaitlin Hague, Kristan Ford, Luke Marino, Shannon Metzeling, Simon Lyell, Stewart Matthews). Unfair of me to highlight one dancer, but Luke Marino is certainly one to watch for the future. The Savoyards is an amateur, community-based theatre company with high standards, bringing major musical productions to the local stage. Audiences are fortunate that the team put together such an excellent variety of shows, and attract some great performers. The leads were well-cast, although I wondered if Kyle Fenwick (Miss Sunshine) was suffering with a cold on the day. Danika Saal (Mama Morton) certainly did justice to When You're Good to Mama, relishing the role of the manipulative Matron with the soft spot for the convicted Hunyak (Jessica Boersen). Moore was a good choice as Billy Flynn, the role suiting his vocal range and enabling him to demonstrate his acting, dancing and comedic skills. Equally Enchelmaier was up to the challenges of playing Roxie, particular when enjoying major set-pieces such as Roxie, Nowadays, and of course the almost showstopping fun when playing the ‘dummy’ to Moore’s ventriloquist (We Both Reached for the Gun). Nash has a strong voice, and she can certainly dance; her I Can't Do It Alone deserved better applause than it attracted on the day, and of course Nowadays was an understandable crowd-pleaser. Amos Hart (Rod Jones) was the standout….an interesting feature of a role with a solo about his invisibility (Mr Cellophane). Great character acting and a very impressive pratfall (or was it just a well-worked recovery from a trip on the day?). Let’s hope that the Savoyards again have Guys and Dolls in their sights. It would be interesting to see Jones as Nathan Detroit, and I am sure the rest of the leads would love the chance to audition to join him. The success of any show depends not only on the cast but also of the work of those behind the scenes. Chicago must be a gift to any talented and enthusiastic costume designer. The Savoyards team, led by Kim Heslewood, didn’t disappoint: short skirts, a suitably powerful outfit for ‘Mama,” great circus and ‘crowd’ outfits for the ensemble, and fabulous sequined flapper costumes for Enchelmaier and Nash’s final number. It was lovely to see the orchestra centre stage, but I wonder if this may have created some challenges for the sound team (David Sowdon & David Longton). There were a number of points where the sound, and also the lighting (Alan Nutley), detracted from the performances. I am sure the lighting and sound issues will be addressed for the rest of the run, but it was disappointing that these problems hadn’t been ironed out after the first show. Lighting and sound were an intermittent distraction during the matinee I saw. Lead actors were occasionally left in the dark—particularly noticeable on many occasions stage right, but also at the climax of Nowadays/Hot Honey Rag, when Enchelmaier’s face almost completely disappeared. The sound, particularly in the first half, was cranked up a little too high, leading to what a fellow audience member described as ‘disembodied’ character of many of the voices (noticeable for example when the Ringmaster opened the show). Some of the microphones continued to crack and pop into the second half, but at least the feedback problems of the first act were resolved during the interval. However, once these issues are resolved, I am sure the audiences in the rest of this sell-out run will have a ball. Verdict: Well-worth going if you can. Look out for the opportunity to buy 2019 Season Tickets (available November 2018). Audience tip: Arrive early, as there is plenty of parking and lots of space in the foyer for drinks before the show. Seats in row I & J might be preferred (or H for those requiring mobility assistance), but all seats appear to provide an excellent view. 2 hours 35 minutes (including 20-minute interval), and note the advisory (adult language and themes). Chicago has only 8 performances and it appears that the rest of the shows are sold out (opened on 29 September and closes on 13th October). Tickets may still be available at The Savoyards website $50 ($45 10+ Group, $47 Concession, $28 Junior). Or why not keep an eye on the website and book ahead for the 2019 season. 2019 Season ticket sales open in November. The reviewer attended the Saturday 6th October 2018 matinee (1:30pm). Despite having seen both the original London production and the Hugh Jackman film, I must confess that Les Misérables is not my favourite show. Indeed, it might even vie for the title of my least favourite musical to date. So my congratulations to The Savoyards team for a very professional production, which held the rapt attention of a sold-out audience, and provided some memorable moments for this reviewer—including excellent casting with strong leading performances, solid duets, good diction, and great production design. Set in revolutionary France, Les Misérables touches on themes of social injustice, hypocrisy, love and compassion. Valjean (Shannon Foley) and Fantine (Sarah Copley) each seek to create new identities in order to be able to work and to gain some semblance of respect—where their respective ‘crimes’ were the stealing of a loaf of bread and being abandoned with an illegitimate child. Fantine is forced into the prostitution that leads to her death, and Valjean then spends the remainder of his life as a ‘free’ man running from the determined Javert (Christopher Thomas) while bringing up Fantine’s child, Cosette, as his own. Contrasting the life of the powerful with that of the oppressed and impoverished, the tale includes the failed revolutionary student barricade, and by the end of the show many of the main characters are dead. But it’s not all gloom and doom: the tale includes comedic moments from the scheming inn-keeping duo (Warryn James and Julie Eisentrager) and concludes with the optimism of a new life together for Cosette (Belinda Burton) and Marius (Matthew Geaney) with the coming revolution indicated in the powerful ensemble reprise of Do You Hear The People Sing? The leading actors were well-cast, with particularly strong performances by Shannon Foley (Jean Valjean) and Christopher Thomas (Javert). Both roles are challenging, requiring actors with a wide vocal range and the ability to convey moments of realisation and transition. Fortunately, both Foley and Thomas were excellent. The leads were compelling together in The Confrontation, and the audience were enthralled with Thomas’s performance of Soliloquy (Javert's Suicide). But it was Foley who stole the show with his Bring Him Home, showing the full range of his powerful voice. A memorable moment. Perhaps the most well-known songs from the show are two numbers by female leads—which can prove challenging for actors who are competing with well-loved and well-known recordings. However, we were in safe hands. Erika Naddei (Éponine) was perfect as the inn-keepers daughter, movingly conveying her unrequited love for Marius in On My Own. Sarah Copley’s Fantine was one of the most believable performances of the role that I have seen, culminating in a tender and beautifully-judged I Dreamed A Dream. It was not only the individual numbers that were well-received. Duets were a definite hit in this show. Not only between Foley and Thomas, but also Fantine's Death: Come to Me (Foley and Copley), A Little Fall of Rain (Naddei and Geaney) and the crowd-pleasing ‘duet’ A Heart Full of Love (Burton, Geaney, Naddei). Equally there was some good ensemble work—including the students’ Red and Black, and the full cast/ensemble Do You Hear the People Sing? And when I say ‘full cast’, I mean full, as the Show had over 50 performers. Fortunately, the production had a really great set (Raymond Milner) and excellent lighting design (Allan Nutley), allowing the director (Robbie Parkin) to use the stage to great effect. It is marvellous to see 40+ people on any stage, but it can bring its challenges. There were occasions when I’d have liked to see more fluid dancing or movement around the stage in the big set-pieces, but Master of the House certainly got the toes tapping and was rewarded with lots of laughter (great comic work from Eisentrager and James). The musical is particularly known for several popular songs, and also for the clever development of key character themes (music by Claude-Michel Schönberg). Geoffrey Secomb (Musical Director) did his best with the orchestra, and I certainly came away reflecting on the way in which the musical themes develop throughout the show. But there were several times when the horns could have been better, and many when pianissimo was called for, to ensure that the actors were not swamped. The professional approach of The Savoyards team—from media through to program (Sharyn Hall and colleagues) and costume design (Kim Heslewood)—provides a great value opportunity to see some of the classics of musical theatre. It was good to see the work they put into developing new talent, with younger actors (including Giselle Roe, who gave a confident performance as Young Cosette in the 6 July performance), as well as bringing back established performers to the local stage. Long may it continue. Verdict: Hats off to The Savoyards for bringing this ‘classic’ to the local stage. Can’t wait until September as Chicago is next (29 September – 13 October, 2018). Put 15th August in the diary now to be first in line to secure your tickets. Audience tip: Arrive early, as there is plenty of parking and lots of space in the foyer for drinks before the show. And don’t forget to take some tissues—it’s a tear-jerker. 2 hours 55 minutes (including 20-minute interval). The season is now almost complete (the Show opened on 23rd June and closes on 7th July). Tickets may still be available at The Savoyards website $50 ($45 10+ Group, $47 Concession, $28 Junior). The reviewer attended the Friday 6th July 2018 performance. Picture Credits: Production image by Michelle Thomas. Banner image of full cast curtain call by Geoff Lawrence. 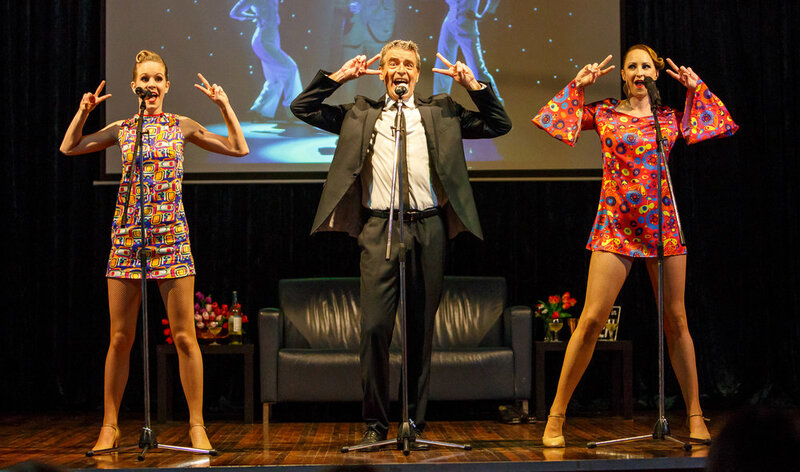 Dale Pengelly’s Lounge Suite is a two-hour song and dance show packed with anecdotes, tap-dancing, high-kicks, and even opportunities for audience participation. 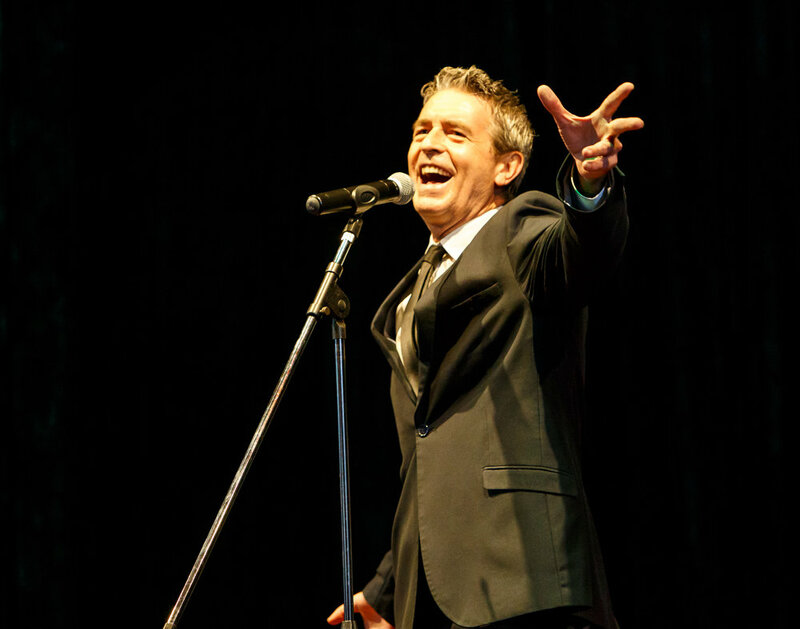 The program combines Dean Martin-style/’rat-pack’ classics with a sequence of musical theatre numbers—all threaded together with some of the many highlights from Dale’s 36+ years in showbusiness. Pictured (L to R): Maureen Bowra, Dale Pengelly and Jenny Usher. Picture credit: Geoff Lawrence, Creative Futures Photography. The Lounge Suite isn’t purely a one-man show. Hello Dolly was a great choice for the opening number, with close harmonies provided by the Candy Shop Show’s Maureen Bowra and Jenny Usher, who returned to the stage at different points during the evening—including encouraging and leading the audience in two great participation numbers. For example, Everybody Loves Somebody was a fantastic choice as an audience participation number, and everyone certainly had as much fun with the fans as Dale did performing that one. Pictured: Everybody Loves Somebody. Dale Pengelly (centre), with fans. Picture credit: Geoff Lawrence, Creative Futures Photography. The “story-time” anecdotes were well-chosen and kept the audience enthralled as names were “dropped” left, right, and centre. Great to see both photographs and video illustrating Dale’s cv—in particular, the Paula Yates dance lesson (by Dale and Hot Shoe Shuffle colleagues) which led into the enjoyable performance of L-O-V-E. Suitable changes of pace ranged from the entertaining and well-choreographed Sway and the cast having fun with Amore (using the lounge at the back of the stage to great effect), through to the touching Tenterfield Saddler (introduced as “my tribute to Todd McKenney”). Musical theatre is no easy gig. From his early days in State and National ballet companies, Dale moved on to performing/understudying some of the major roles in musical theatre (with many national and international tours), as well directing and choreographing a number of shows. To maintain a steady program of work over a period spanning almost four decades is impressive—particularly when the performer can still tap dance and high-kick in the way that he does. Just watch out for the high-kicking in New York, New York! The audience certainly got their value for money, with over 20 pieces including dance solos, a voice solo by Maureen, and two dance duets featuring Jenny (Rich Man’s Frug with Maureen, and You Were Meant for Me with Dale). Pictured: Dale Pengelly. Picture Credit: Geoff Lawrence, Creative FUtures Photography. I am sure that The Lounge Suite would work well as a Dean Martin tribute show, leaving ‘my life in musical theatre’ as a separate piece. It would have been great to see this Show with a larger audience (but the crew attending on 25th May had a ball), and perhaps better sound monitors onstage for the performers. But at $30 for a 2-hour program of music and dance, I am sure the audience didn’t feel short-changed. Verdict: I would love to see this with a live band. Look out for future opportunities to see Dale Pengelly. Audience tip: Easy on-site parking, and great value drinks and food available at the Queensland Russian Community Group, Woolloongabba. A two-hour show (including a 20-minute interval). Tickets at the Anywhere Festival website. $30. Friday and Saturday performances during Anywhere Festival 2018 (11, 12, 18, 19, 25 & 26 May. All 7:30pm with one 3pm matinee [19 May]. Presented by Pengelly Productions at Anywhere Festival, at the Kenmore Retro Bar, and Woolloongabba Queensland Russian Community Group. Suitable for audiences of any age. The reviewer attended the Friday 25th May performance at the Queensland Russian Community Group, Woolloongabba. Pictures Credit: Geoff Lawrence, Creative Futures Photography.